This article is about an item of clothing. For other uses, see Apron (disambiguation). An apron is a garment that is worn over other clothing and covers mainly the front of the body. It may have several different purposes and is today perhaps most known as a functional accessory that layers over one's outfit to protect one's clothes and skin from incidental stains and marks. However, the apron may also be worn as a purely decorative garment, for hygienic reasons and to protect from dangers such as excessive heat. An apron often gains sentimental value overtime because one who wears an apron wears it often, if not always, while doing the work. The routine of putting an apron on before doing ones work can even begin to feel slightly ceremonial, in the sense that it prepares them mentally and physically for the task at hand. Some modern-day aprons have humorous expressions, designs or corporate logos. The bib apron (also known as the “French chefs apron” or a “barbecue apron”) has been worn for centuries. The bib apron's humble beginnings began when people used scraps of fabric to make a bib-like covering that slipped over the neck and tied at the back. The bib apron’s intuitive design and full coverage have made it a popular apron for tradesmen and people in low-economic classes since the 1880s—and maybe even earlier. In the 1960s—when women no longer wanted an apron that symbolized domestic ideals—the bib apron became the most-used apron and is now offered in a multitude of variations, colors, detailing and fabrications. While bib aprons dominate the professional apron market, many women make homemade aprons from vintage patterns, colorful trims and playful fabrics. These homemade creations are often given as gifts. Pinafores may be worn by girls and women as a decorative garment or as a protective apron. A related term is pinafore dress (American English: jumper dress); it is a sleeveless dress intended to be worn over a top or blouse. A pinafore is a full apron with two holes for the arms that is tied or buttoned in the back, usually just below the neck. Pinafores have complete front shaped over shoulder while aprons usually have no bib, or only a smaller one. A child's garment to wear at school or for play would be a pinafore. A tabard (British English; cobbler apron in U.S. English) is a type of apron that covers both the front and back of the body. It is fastened with side ties or with waist bands that tie in the back. It covers most of the upper part of the body and is used in many occupations, like bakeries, Hospitals, and large retail stores. The original cobbler's apron was typically made of leather. An alternative version uses snaps instead of ties and closes at the front. Such an apron is in effect like a vest and is more commonly sold for domestic rather than occupational use. 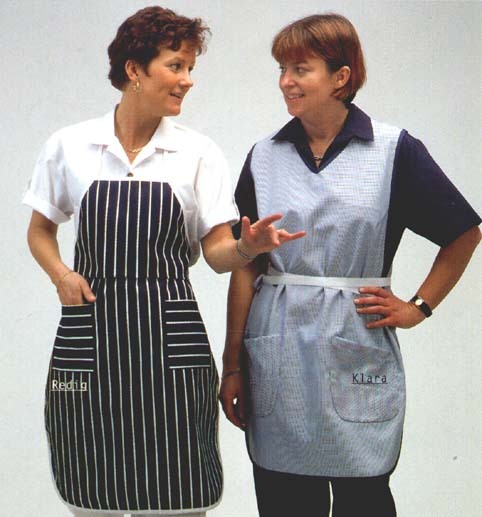 A bungalow apron is an item of women's at-home clothing. Most bungalow aprons were extremely simple garments, often with kimono sleeves (sleeves cut in one piece with the body of the dress), little or no trim, and the fewest possible fasteners. Most date from the first half of the 20th century (roughly 1910 into the 1940s), when they evolved into or were replaced by the "patio dress" or Lounger available today. In contrast to most aprons, they were intended to be worn as a stand-alone garment, not over another dress. They probably developed from the full-coverage wraparound or pullover aprons of the early years of the 20th century. Bungalow aprons fell roughly between nightgowns or house coats and house-dresses; they were appropriate for morning in-home wear but would not have been worn outside of the house, as opposed to a true morning or house-dress, which might have been worn to the grocery store or in other informal situations. The term apron also refers to an item of clerical clothing, now largely obsolete, worn by Anglican bishops and archdeacons. The clerical apron resembles a short cassock reaching just above the knee, and is colored black for archdeacons and purple for bishops. The apron is worn with black breeches, reaching to just below the knee, and knee-length gaiters. The history behind the vesture is that it symbolically represents the mobility of bishops and archdeacons, who at one time would ride horses to visit various parts of a diocese or archdeaconry. In this sense, the apparel was much more practical than a clerical cassock would be. In latter years, this vesture was more symbolic than practical, and since the mid-twentieth century it has fallen out of favor. Today, the apron has enjoyed a minor renaissance in terms of both women and men now wearing them when performing household chores. For instance, an article in the Wall Street Journal claimed in 2005 that the apron is "enjoying a renaissance as a retro-chic fashion accessory" in the United States. However, it still is not as prevalent as it was prior to the 1960s. Aprons are nowadays considered equally appropriate for both women and men by most people. However, prevailing social norms ensure that women frequently wear more delicate clothing, and may therefore be more likely to want the protection an apron offers. This can also be because the apron is the traditional clothing for cooking and washing dishes, usually done by women. 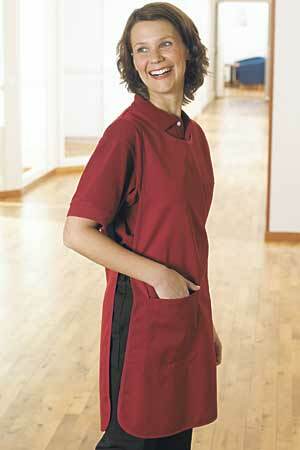 When domestic workers are supplied a uniform by their employers, an apron is often included. The aprons are worn for hygienic as well as for identification purposes. Since fabric was precious in the medieval and Renaissance eras, aprons then were little more than scraps of material tied around the waist with the intent of protecting the valuable clothing underneath. In Europe during the Middle Ages, aprons were worn by blacksmiths, armor and weapon makers, gardeners, carvers, furniture makers, leather smiths, cobblers, tailors, jewelers, metal forgers, fishmongers, clock makers, homemakers, tradesmen, artisans and masons. Tradesmen in general were called "apron men," as aprons were so common that several trades boasted distinguishing styles. and English barbers were known as "checkered apron men.” Cobblers wore black to protect garments from the black wax used on shoes. Butchers wore blue stripes. Butlers wore green aprons. Blue was commonly worn by weavers, spinners, and gardeners. Stonemasons wore white aprons as protection against the dust of their trade, and even in the twenty-first century, aprons survive as part of Masonic ceremonial attire. These aprons were long, coming down to below the knees, with a flap or bib to protect the chest. The Union of the Grand Lodge of England between the Ancient and Modern branches of English Freemasonry in 1813 brought into many effect many changes in dress and ritual which still prevail to this day. In respect to the Masonic apron it was felt necessary to have these standardised and the resulting effort are the aprons we have in use today. The Dutch worn aprons bordered with black and with a skull and crossbones on the flap. Scottish lodges each have their individual right to choose the design, colour and shape of their aprons; some employ a tartan, while many others have a circular rather than a triangular flap. Soldiers of the French Foreign Legion wore leather aprons as part of their ceremonial dress as early as the 18th century. From these utiliarian beginnings, the modern apron got more stylish over time. During the Renaissance, more fanciful aprons crafted from finer fabrics began to appear—usually without bibs and often embroidered. Well-to-do women favored long dresses often with detachable sleeves, and to keep their expensive gowns clean, they wore washable aprons or overdresses in a range of embellishments and materials. Aprons became a fashion statement in the 1500s, when women started adorning them with expensive lace and embroidery. Politics ruled women's fashion in 1650s England when Oliver Cromwell decreed that women and girls should dress properly. This sparked the Puritan look of a white apron covering a long black dress that reached from a woman's neck to her toes. At the height of the industrial revolution in Victorian England, the market was flooded with different types of aprons. The boom of factories and sewing machines meant that consumers had options: one could choose a full-body apron, a linen apron, a linen apron with ruffles or ruching or lace, a grosgrain apron with embroidery, or an apron with a flounce. Aprons were a way of indicating the difference in status between the employer and the employee, and the uniform of the staff was strictly regulated. For example, a housemaid might wear a print dress during the day and then change into a black dress and dress apron for the evening service. In contemporary South Africa, young women wear beaded aprons to celebrate their coming of age. Examples of ancient gods wearing aprons can be found worldwide. Fertility goddess figurines may be the earliest depiction of women wearing aprons. These ancient snake goddess figurines excavated in Crete depicted how Minoan women may have dressed in 1600 BCE: a tight bodice, bare breasts, and an embroidered or woven apron covering a long dress. Monuments and wall paintings in Ancient Egypt depict a triangular-shaped apron with the point upward when the wearer is taking part in some kind of ceremony of initiation. In China, some of the ancient figures of the gods wear semi-circular aprons. In Central America the ancient gods are consistently sculpted wearing aprons. Tepoxtecatl (the preserver) is depicted wearing an apron with a triangular flap. Priests wore similar aprons as a sign of their allegiance to the 'gods' and as a badge of their authority. Aprons were used by both the Native Indians and the pilgrims when America was first colonized—and have been well worn in America ever since. The apron fell out of favor in the 1960s after its rise to celebrity in the 50’s when it became the post-war symbol for family and domesticity. As women started looking outside the home for satisfaction and work, they looked away from the domesticated apron. People started doing their work without an apron entirely or they choose to wear a bib apron (its unisex, simple, boxy design represented the opposite of the 1950s housewife). The bib apron (also known as the “French chefs apron” or “barbecue apron”) remains the dominate apron on the market and is offered in a multitude of variations, colors, detailing and fabrications. Simple, functional aprons were already a staple by the time the Pilgrims docked on the shore of Plymouth Rock. American Indians wore aprons for both practical and ceremonial purposes. Early female settlers wore plain, long white aprons. Later, Quaker women wore long and colorful silk aprons. As cities in New England grew, more elaborate options began to appear. Classy American women in the 18th century wore embroidered aprons that sometimes dipped at the front of the waist (so as to not obscure the bodice of the gown) from 1900 through the 1920s, well-heeled women wore ornate, heavily embroidered aprons. Aprons of the 1920s mirror the style of the times: loose and long. Often closed with a button and adorned with needlework, many aprons styles emerged during this era and stores began selling patterns and kits to make and adorn aprons at home. Aprons of this period followed the silhouette of dapper fashions—long, with no waist line. The “Hooverette” or “Hoover apron” emerged in the 1930s, named after the man in charge of the U.S. Food Administration at the time, Herbert H. Hoover. Women working outside the home wore whatever protective garments their jobs required, including coveralls, smocks, or aprons. At home, they worked in full-length aprons with hefty pockets and a cinched waistline that were often decorated with buttons, pockets and contrasting colors. Aprons became plain during the Great Depression. Since fabric was scarce, women would make aprons out of Flour Sacks and feed sacks to protect their clothing. Pinafore aprons, or “pinnies” as they were affectionately called, began to gain popularity. Dorothy famously wore a blue and white gingham pinafore in The Wizard of Oz. Post-war family values made the apron the symbol of home, family, mother and wife. As Sewing machines and cloth became available, aprons—both commercial and homemade—became the uniform of the professional housewife. Magazines from the 1940s and 50s feature apron-adorned women in nearly every advertisement that is related to housework or cooking. Aprons were a selling feature for irons, kitchen appliances, food products and more. The 1950s brought out the half-aprons of highly starched cotton, feedsack and sheer fabric trimmed with lace for special occasions. Two piece aprons and short smocks of bright cotton prints for every day use were also popular. The postwar archetypal housewife was practical and creative. She made aprons out of remnants, extra kitchen curtains, dish towels, handkerchiefs, and flour sacks. When she made her aprons, she considered design as well as function. Many handmade aprons from the 1950s have one-of-a kind designs and details. Many 1950s aprons addressed housework and were decorated with sewing, cleaning, cooking, and "mom” themes. Husbands in the 1950s weren't immune to the apron-wearing fashions of their times—fathers often sported bib aprons for barbecues on the weekends, often with written statements about Dad's grilling talents. Aprons fell out of favor as women began looking beyond the home and family for fulfillment and as the Feminist Movement began. In response, people chose to wear no apron when they did their work, or they wore a bib apron (sometimes with words like "Kiss the Cook" and "For This I Went to College” written in large type on the front). Aprons remained a staple of the workplace as a means of protecting garments. Aprons were also worn as a work uniform and by people who worked in the food trades—butchers, waitresses and chefs as well as hairdressers and barbers. Many home cooks chose not to wear an apron in the 1980s. Those that did often wore bib aprons or vintage/retro DIY aprons. However, more recently the apron has again enjoyed increasing popularity. Employees in the service industry continue to wear aprons for work, often a bib apron with company logos. The apron is enjoying a resurgence thanks to a few modern cultural factors. The slow foods and foodie movements have inspired people to cook for pleasure and not as an act of subordination; the maker movements glorify the process of creating and the behind the scenes making of things; cooking shows use aprons as a professional accessory; and (unlike in past centuries) dirty work is no longer a task reserved for the underclasses. Today there is no negative social stigma associated with doing ones own chores (like cooking and cleaning) or with pursuing messy hobbies or careers (like styling, gardening or painting). ↑ "Apron Uniforms Today". Pinterest. Archived from the original on 2017-01-09. 1 2 3 4 5 "History of Clothing - Aprons - Practical and Decorative Fashion Classics". Archived from the original on 2016-12-20. 1 2 3 4 "The History and Resurrection of Aprons". Archived from the original on 2016-12-20. ↑ "Apronera is a Stylish Layer". Archived from the original on 2016-12-23. ↑ "The history of the apron". Archived from the original on 2016-12-21. 1 2 3 "Bib Aprons". Pinterest. Archived from the original on 2016-12-23. ↑ "Hedley & Bennett // Handmade Chef Gear". Hedley & Bennett // Handmade Chef Gear. Archived from the original on 2016-12-30. 1 2 3 4 5 6 7 8 "The Long and Illustrious History of the Apron - The Aprons.com Blog". blog.aprons.com. Archived from the original on 2016-12-20. 1 2 3 4 5 6 "The History of Making a Mess and Staying Clean". 26 March 2015. Archived from the original on 21 December 2016. ↑ Burton, Ida Robinson; Burton, Myron G. (1916). "Bungalow Apron". School Sewing Based On Home Problems. Ginn And Company. Archived from the original on 2013-01-31. Retrieved 2013-01-22. ↑ "BetterBaking.com - A History of Aprons and Apron String Cuisine". www.betterbaking.com. Archived from the original on 2016-12-23. Retrieved 2017-01-20. 1 2 3 4 5 "Aprons - LoveToKnow". Archived from the original on 2016-09-11. 1 2 3 4 "Archived copy" (PDF). Archived (PDF) from the original on 2017-05-10. Retrieved 2016-12-17. ↑ "Archived copy". Archived from the original on 2016-09-11. Retrieved 2016-12-17. "Archived copy". Archived from the original on 2016-12-20. Retrieved 2016-12-17. ↑ "Archived copy". Archived from the original on 2016-12-20. Retrieved 2016-12-17. "Archived copy". Archived from the original on 2016-12-21. Retrieved 2016-12-17. ↑ "Vintage Aprons". Pinterest. Archived from the original on 2017-01-09. ↑ "History of Clothing - Aprons - Practical and Decorative Fashion Classics". Bellatory. Archived from the original on 2016-12-20. Retrieved 2017-01-20. ↑ "The apron ascends to costly kitchen couture". old.post-gazette.com. Wikimedia Commons has media related to Aprons.